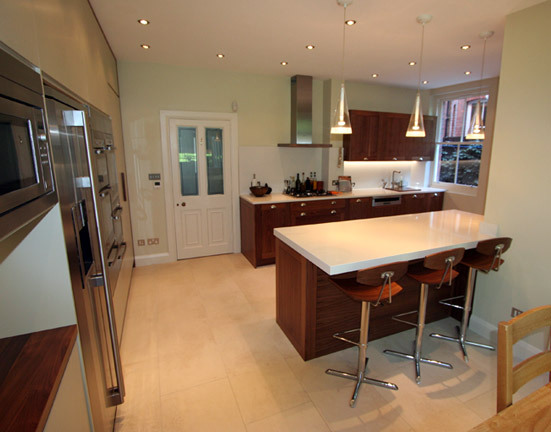 This kitchen was made using a combination of finishes to keep it light but to give it a warm high quality feel.The floor to ceiling units were finished with hand painted Farrow & Ball colour and the base and wall units were walnut veneered paneled doors. The carcasses were made using melamine faced mdf. There are also some nice custom features such as the larder unit, the spice rack and the cutlery drawers. We also used a combination of work-tops, the main two being made from reconstituted stone and solid walnut.